North Korea may have successfully produced a nuclear weapon small enough to fit inside its missiles. That information comes from a Japanese defense paper and an American newspaper. Japan's Defense Ministry released its yearly report on Tuesday. The report said "it is possible that North Korea has achieved the miniaturization of nuclear weapons and has developed nuclear warheads." 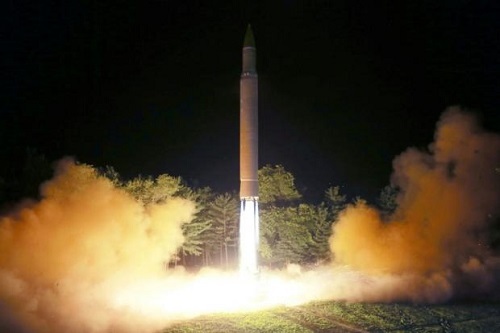 In a separate story, The Washington Post reported that North Korea has successfully produced a miniaturized nuclear warhead for use in ballistic missiles. The newspaper said its information came from unnamed United States intelligence officials. It said their investigation was completed last month for the U.S. Defense Intelligence Agency. The paper also reported that North Korea has up to 60 nuclear weapons, more than two times greater than earlier estimates. Officials at the agency would not comment Tuesday on the Post report. Over the weekend, the United Nations Security Council approved new sanctions designed to punish North Korea for its latest missile test. Those measures aim to cut about $1 billion from North Korea's $3 billion in yearly earnings from exports. The North Korean government reacted to the Council's vote with threats to take action against the U.S. government. North Korea also said through its state-operated media that sanctions will not force it to negotiate over its nuclear program. The United States, Japan and South Korea are considered possible targets for a nuclear-armed North Korea. We have conducted a new nuclear weapon test successfully. Ukraine's Defense Ministry said a third helicopter was also hit. Its yearly report hasgonegrown to a list of 180 countries. His supporters have reacted to the news with elation. 1.Those measures aim to cut about $1 billion from North Korea's $3 billion in yearly earnings from exports. They aim to clear every dealer from the street. We aim to increase sales by 10 percent. 2.The North Korean government reacted to the Council's vote with threats to take action against the U.S. government. We had to take action to protect the proprietary technology. We must take action to deal with the problem before it spreads to other areas.